Stellar cartography is a fairly new field of astronomy, although the question of our place in the Universe has been one of the central questions of our species for thousands of years. Pythagoras and Aristotle surmised that the Earth was spherical in Ancient Greece, and the approximate (within 2%) circumference was measured by use of shadows in different latitudes by Eratosthenes in ancient Egypt in 240 BCE. From here, the question of our location in the cosmos varied by culture, with the Catholic Church resisting the notion that the Earth was not the center of all things for hundreds of years in Europe until the days of Copernicus and Galileo. It was really not until the rise of modern Astronomy and optics that our understanding of our location started to come into focus. During the Electronic Age, technology has further enhanced our understanding by leaps and bounds. For instance, Google Sky allows one to view the cosmos, much in the way that Google Earth allows people to view various locations on Planet Earth. Another fascinating website to check out is Secret Worlds – The Universe Within, which takes one from a view of the macrocosm into the microcosm in steps. The video below demonstrates this, but the website linked above is really the best place to experience this. 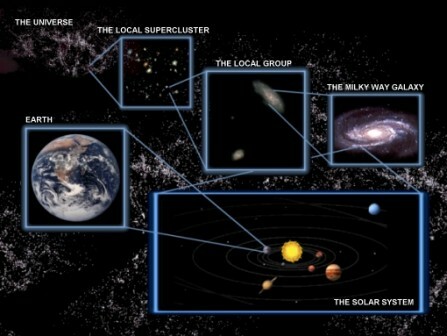 National Geographic released an outstanding map of our location in the universe. The full size picture can be found here. Finally, below find an excellent Wikipedia image from the user Azcolvin429 that demonstrates exactly where in the Universe we are. Find the full resolution version here. March 5, 2010 Do Earthquakes Trigger More Earthquakes?